This wonderful recipe comes from a new beautiful cookbook, A Kitchen In France (it is called Chou Farci). It is so pretty when cooked and delicious! It will easily serve 6-8 guests. Bring a large pot of salted water to a boil. Meanwhile, core the cabbage leaves and separate them, discarding any coarse outer ones. Cook the leaves in boiling water for 8 minutes. Drain and set aside to cool. Grease the bottom and sides of a 7″ souffle dish with butter. Put a large pretty leaf, domed side down, in the dish. Top with another leaf and continue arranging the leaves on top of one another until the entire base and sides are covered. You won’t use all of th leaves at this point (reserve enough for 4 or 5 layers). Heat the olive oil in a large saute pan over medium high heat. Cook the onions and carrots until softened, about 4 minutes. Add the ground beef, sausage, garlic, thyme, bay leaf, spice, and salt and pepper to taste and cook, stirring until browned. Pour in the crushed tomatoes with their juices and simmer until nearly all of the liquid is absorbed, about 5 minutes. Transfer to a bowl and cool. Preheat oven to 350 degrees. When meat mixture is cooled, discard the thyme and bay leaf. Add the egg and mix well. 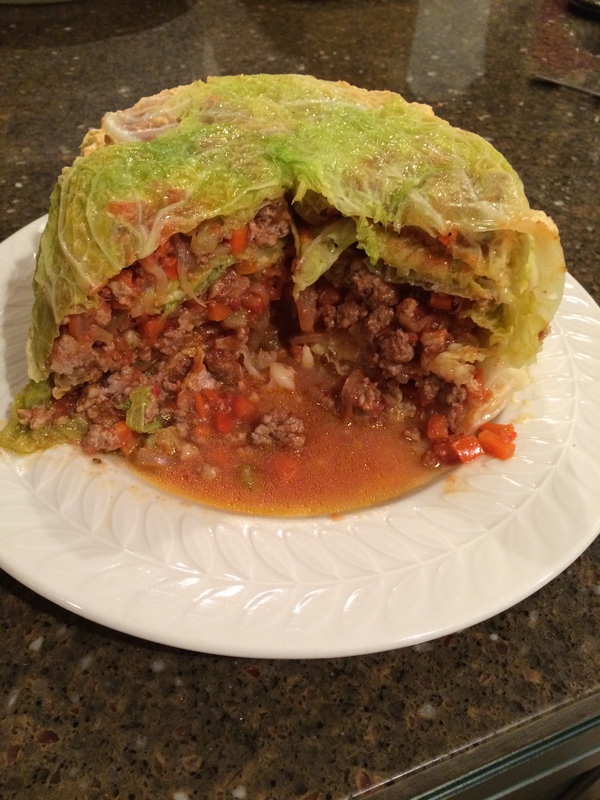 Put a layer about 1/2″ thick of the meat in the cabbage lined dish and top with a cabbage leaf. Repeat until you’ve used all of the meat and filled the dish, about 4 layers. 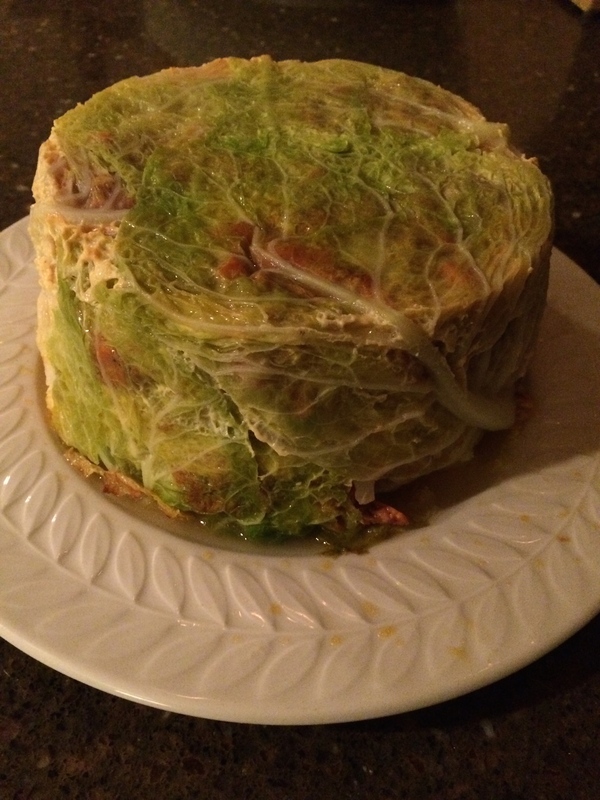 Finish with a final layer of cabbage, making sure to tuck in the leaves on all sides. Bake for 40 minutes. To unmold, invert a plate over the souffle dish and flip the plate and remove the mold. Serve immediately , cut into slices.